One touch pass and follow through at the target. Get the top hand away from the body. Pass and rotate. Three or four players one touch pass around a circle. 1 - Pass 6 to 12 o'clock. 6 to 3, 12 to 9, player three stay at 6. 2 - Pass 12 to 3 o'clock. 12 to 9, 3 to 6. 3 - Pass 3 to 9 o'clock. 9 to 6, 3 to 12. 4 - Pass 9 to 6 o'clock. 5 - Repeat starting with player three at 6. *Go around 3-5 times and then change direction. The hockey world wonders what they do in Finland to develop so many world class goalies. One thing is that they have goalie coaches at all levels. I will post some Finnish goalie practice from the U20 IIHF World Championships. Goalie be square with the puck carrier out of the corner and push and slide across to be square to the one timer shot on the far side. A. Player one walk out of the corner and pass to player two going to the net from the far corner. Player two take a one time shot. B. Player two circle back and go to the far post from the top of the circle. Player one get a second puck and skate out of the corner and pass to player two. Give and go pass. Give a target and make eye contact before passing. Dean and I were watching and at first it looked like the power play as it was 5-4 and then we realized a coach was playing to make it 5-5 and we figured out what the game was. We don't know the practice plan and the camera picks up our conversation. One touch passes and one timer shots are used. Face the play with the stick on the ice and give quick support. 1. Play at one or both ends. 2. Transition to offense by making one pass. 3. Puck must stay inside the blue line or defenders get it. Here is another goalie drill that the Finnish U20 team did. Goalie must track the puck from side to side and use the inside edges to push. 1. Coach pass to a forward. 2. Two forwards attack 2-0 with a one timer shot and look for a rebound. 3. One forward pick up a puck from either corner and pass to the other forward who shoots a one timer. Allow the attackers to cross the blue line before leaving. 3. Defenders 3 and 4 leave and the support the defense from the top of the circle. 4. Offensive 1 and 2 must attack with speed. One touch pass. Firm stick and follow through at the target. Both line move all the time. B6 from diagonal corners down each side of the ice. Start with one player at each line and one extra behind. A. 1 skate and give and go with 2. B. 1 give and go with 3. C. 1 give and go with 4. D. 1 go in and shoot-rebound and become 5. E. 2-3-4-5 keep moving forward after each pass. Continue this flow from each side and then move to the other side and change directions. This is a drill that Russian Olympic coach Vladimir Jursinov used when I was coaching with him in Austria. The goal is to get players to practice passing and shooting while they skate. Puck handling-passing-shooting should be seamless. Pass to either side or either player who is breaking for a pass. Give a target, stick on the ice, face the puck. A. Players line up on both sides at the blue lines. B. 1 pass to 3 and 1 and 2 skate toward the far blue line and cross. C. 3 pass to 4 or 1 or 2 up the boards. D. 1 and 2 attack, shoot and rebound. E. Rotate starting from each line. *Options are to circle back and rebound for the next shooter or give and go from the goal line for the next shooters. Goalie play from out to backing in to the net ready to poke check if the player exposes the puck. Shooters make the goalie move first and shoot where they are coming from and not where they are going. Shoot five hole if they open up, high if they go down and just over the pad and under the glove when they are down. Make them cover the entire width of the net by coming in from a side. Players line up along the blue lines at each end and take turns shooting. Create competitions and eliminations to make it competitive. I have posted this quick up passing drill before but without a video. I like to use it for good habits like passing while moving, giving a target, attacking quickly. The video has the 1-0 and 2-0. You need about 20 skaters to do the 3-0 because it there isn't very much waiting in line. I picked this up from American coach Gene Reilly when I was coaching for the Red Bulls. top hand away from your body. Call for the pass. Give your stick and skates as a target. lane. Pass to the player in the middle. trailer pass to the high man as the first shot. I was going from rink to rink in the 4 rink complex at Canada Olympic Park. Every rink had a different team practicing. Sometime I was with other coaches and sometimes alone. The audio often has me trying to figure out what the team is doing in the drill or game. In this game it looked like three groups rotating at the start but after a while I realized they were playing Shinny with no rules or if they had any skill rules I couldn't tell. I often have my teams or skill groups play but most of the time have rules like one touch in each zone or 2" with the puck only or a stickhandling game like - you can't pass until you cross a blue line and if you get a pass in the offensive zone you can't pass but must try to score. So anyway the Russians were playing shinny and they seemed to do this as a cooldown activity and usually ended with a shootout. Everyone plays at once. No offsides and no rules accept good sportsmanship. Great for developing puck handling skills and recovery after a hard practice. This is the Russian U20 team playing shinny at the end of two practices. Everyone plays including the coaches and the extra goalie. They played shinny at every practice. The players enjoyed the games and it was a very different atmosphere than the North American practices which were so military with whistles all of the time, coaches barking and making many passes in command style, coach centred sessions. Hockey seemed like a Game at the Russian and other European practices and a Job at North American sessions. Shinny definitely has it's place in hockey but it seems long gone. Outdoor ice, depending on climate, is becoming more scarce here in Calgary. Many rinks have disappeared entirely and now, most of the "X-Box generation" stay at home - playing it on TV. I like adding the odd rules to the Shinny games (stupid adult coach that I am... ruining a perfectly good game of kids shinny, eh?) to help them learn too. But time and place, coaches... right? Your final quote about the difference between the European and NA sessions really hit home. It certainly did look more business-like for the NA teams. Part of the reason was the amount of media coverage / closeness to home for Canada and USA; but even if the event was in Europe (drawing nowhere near the fans for this level! ), the NA teams would still appear to be more under the media microscope. I thought coaches may be interested in the parts of practice where Russian players practice skills on their own. Even a Russian legend is out there with his shoes on. They love the game and enjoy themselves. Players work with the coaches and do skills with good hablits. In all of these drills a player could pass instead of a coach. 1. Players line up behind the blue line and skate into the neutral zone and then flare out towards the boards facing the puck and give a target. The coach passes and the player attack and shoot. Follow the shot for a rebound and then circle back to rebound for the next shooter. 2. Player get a regroup pass from the coach along the boards then shoot-rebound. 3. Coach pass to a player from the side boards to the point and the player take a one timer. Jokers can only pass and shoot. One coach is a joker for each team. Face the puck, do everything quickly and create offensive 2-1's. 1. Play cross ice 3 on 3. 20-30 second shifts. 2. Use only one puck unless it is shot out or in the net. 4. Change on the whistle. Another drill that Finnish goalie coaches use to produce those great goaltenders. Goalie must stay square to the puck and make the save and then battle to stop the rebound. 1. One player on each side and one at the mid point. 2. Players take turns skating in and shooting while the other two skaters come in for a rebound. Get the defender to commit before passing. Coaches give passive resistance. Attackers keep the feet moving. A. Coach dumps a puck into the corner. B. #1 get the puck and drive skate. C. #1 pass into corner when checker has a good angle. D. #2 drive to the net and shoot while 2 and 3 crash for a rebound. E. Repeat on the other side but #2 pass to #4 at the point who passes across to #5 for a one timer. F. #'s 1-2-3 screen, tip and rebound. Pass hard and quickly. Always face the puck and accelerate with the puck. Shoot with the feet moving and shoot to score - not to shoot. One touch pass on puck exchanges. A. 1 and 2 leave from diagonal blue lines. B. B3 pass to R1. C. R1 one touch back to B3. D. B3 pass to R2. F. R2 skate around circle for pass from R3 and attack the other end. G. B1 and B2 do the same sequence from the diagonal blue line. H. Repeat the other direction with B4 and B5 passing to R6. *Follow shots for a rebound and then screen or circle back to rebound for the next shooter. 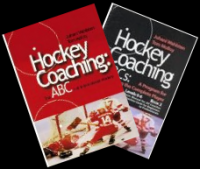 Juhani Wahlsten designed the coding system so it is easy to find drills and games because they are classified according to what kind of skill, where the players stand on the ice and whether it is an individual, partner, team play, game, transition game, goalie activity etc. Otherwise a coach has all kinds of drills on sheets of paper that he has to look through all of the time to find something. All of the diagrams use International Symbols which give consistency and coaches from around the world can understand the diagram whatever language they speak. There are nearly 500 ideas so far. My favorite game to warm-up the players at the start of practice. The quicker they make the passes after regaining the puck the more scoring chances they produce. This video shows the Swiss U20 Team playing 2 Pass as a warm-up. 4. Make rules with skills for skating, shooting, passing or good habits. So the game is a template to either use as itself or modify rules to cause the players to do skills or moves within a game situation. * I add skill rules such as one touch passing, goals on one timers, only back hand passes, only forehand passes, goals must result from plays below the goal line, maximum two seconds with the puck, maximum one second with the puck, goals must result from plays from the point, you must make an escape move before passing, etc. Whatever you want the players to work on within a game situation can be the rule modification for 2 pass. There was confusion on the date of the Spin Class and no instructor was there. The players took control and instead of going home they warmed up with a few laps around the track, did core exercises with each player leading one and then Kiera, an assistant captain took the leader bike, mike and music and led a 30 minute spin session. Pass while skating. This exchange overloads the nervous system and works on quick reactions. Add more passes and tasks as the players improve. A. Player 1 from each line skate and exchange pucks two times. B. Players continue skating, shoot and follow the shot for a rebound. C. Screen for the next shooter. D. Circle back and rebound for next shooter. E. Give and go with the next shooter. F. 1 and 2 exchange passes with diagonal 1 and 2 and all get a pass. G. Three players leave and exchange passes. H. After shooting defend 1-1 vs next shooter. Keep your head on a swivel so you can read where the next play is going. Skate to open ice with the puck and look to pass. 1. Use four nets. One at each end and one at diagonal blue lines. 2. Divide the players into four teams. 3. Each team defends one net and can score on the other three. 4. Allow the defending team 5 metres to take the puck out of their net when scored on. The Swedish Ice Hockey Association has a website with great drills and games. I am going through them and doing diagrams of the drills. Coaches can go to the link for the site to watch them. They are very well done. A lot better than I can do with my camera. The videos have more than one drill but I am sure the coaches that come here are smart enough to figure that out. On offense protect the puck, shoot while skating and follow the shot for a rebound. On defense play from the net side with the stick on the puck. Stay with the attacker and control the stick after the shot and then look for the puck. 1. Attacker and defender leave from the blue line and the passer is on the other side of the ice above the dot. 2. Attacker skate into the slot for a pass and the defender skate backward. 3. First pass is in the slot and battle to score and defend. 4. Second pass happens when the first battle is over and the puck is shot into the far corner. 5. Attacker protect the puck vs. defender and battle to get to the net and score. Defender, stay between attacker and the net and box out the attacker and seal his stick to the outside. Attacker, screen the goalie and keep stick free to redirect puck. Fight for a rebound shot. 1. B1 pass to B2 at the point from the corner. 2. B1 go to the front of the net and R1 skate with B1 to defend. 3. B2 skate inside dot and shoot. 4. B1 battle with R1 to screen and tip and score on the rebound. 5. R1 maintain net side and seal B1 stick to the outside and battle to clear the rebound. The most dangerous attacker is in front of the net. Play 2-1 but really a 2-2 as the goalie takes the shooter and defender denies the pass. Seal the stick to the outside on the shot and tie up the stick and then look for the rebound after the shot. 1. Coach has the pucks and passes to either the point or behind the net. 2. Players at point and behind can only shoot or pass. 3. Defender deny pass to the player in front and rebound goals. 4. Repeat about three times. Attack with speed and make the defender collapse to the middle and try to get by when they skate outside. Defender keep no more gap than a stick length. Defend from the net side always. Stay with attacker after the shot and tie up the stick. A. R1 pass to B1. B. B1 attack and try to score while R1 defends. C. Go for the rebound after a shot. This can be done from either one or both sides at the same time. The pucks are in the middle and each player gets one shot vs. each goalie with the team that scores the most goals the winner. Players leave from diagonal corners. In this video of the Russians the losing team had to walk on their knees from the blue to the red line. F1 must get to the puck first vs. D1. Attackers protect the puck and go to the net. Defender must stay on the defensive side and then play a 2 on 1 situation after the cycle always recognizing the most dangerous attacker. 1. Two forwards and one defender start from behind the blue line with forwards on the inside. 2. Coach shoot the puck into the corner. 3. F1 race D1 to the puck. 4. If F1wins the battle then protect the puck and pass to F2. 5. D1 defend 2 vs. 1 until the puck is frozen or cleared. 6. If D1 wins the race then he clears the puck.